This trail is still being built. Every time I ride the end is pushed out a little more. 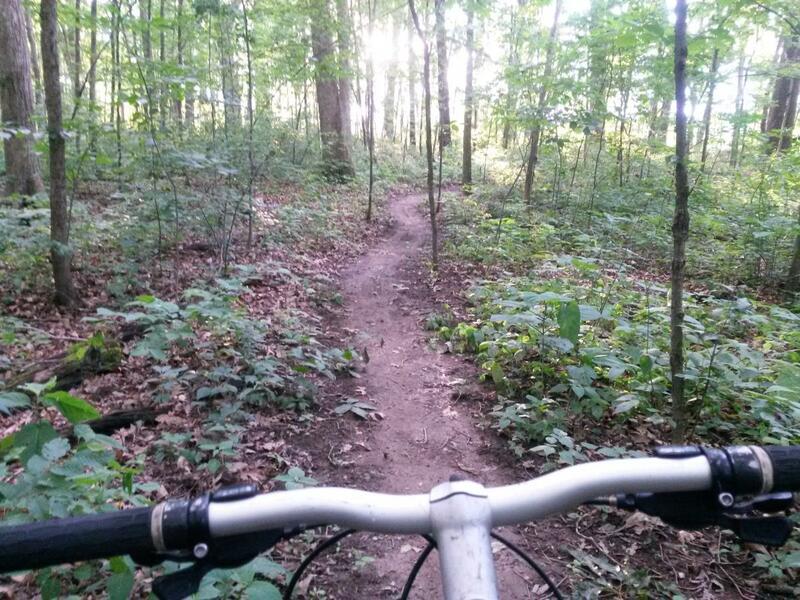 The trails so far are pretty nice, kind of an old school flow trail (not 5' wide). There is little in the way of rocks or roots on the trail - it's mostly just fast. There is some climbing, but the quick downhills make it worth it. Review: As of July 2017 the trail system is not finished, with less than half of the planned distance completed. Leaving the parking area you ride down the side of the road for a hundred feet and then turn down an old dirt road. The mtb trail is off to the left - there is a sign. This is the 'front loop' - a small loop between the road & creek, with the longer trail branching off of it. About 1/2 mile in (after the section crossing the cleared pipeline right of way) there is a trail intersection. Going to the left takes you out to the longer, unfinished trail, while taking the right trail 'to exit' finishes the short 'front loop'. Note that the section of the front loop between the intersection and the exit to the old dirt road has the most broken glass on it that I've ever seen - literally thousands and thousands of glass shards in the tread. The unfinished trail goes across the creek (easy crossing), and becomes what I'd have to call a 'flow trail'. The tread is mostly free of rocks & roots, with some long stretches that are amazingly smooth. Using the slight variation in elevation along the the lakeshore, it alternates easy climbs with well thought out downhills. There are a couple of bridges crossing various small creeks - they are wide enough to cross at speed, and all seem to have a smooth & fast transition from both sides. Since the trail is not done you'll eventually just come to a spot where the trail is just gone (not built yet), where you turn around and ride it back out. Note that there are already some Strava segments on the trail that is finished. Lake Milton State Park MTB Trail 4.00 out of 5 based on 1 ratings. 1 user reviews.